Well...more like continue and go into a fervor. The movie is about a week from release and already some people have seen it, including famous anime & DBZ fan dubber Lanipator. His review of what he saw says it all. I'm sorry guys, any hope of this being somewhat of a film us fans maybe, maybe wanted is practically up in smoke. The trailers show much of what we fear but I'm a cup-half-full kind of guy. Sadly, even with my optimism...there's not much hope here for a person who looks like and personifies himself with DBZ's Trunks (yeah, yeah I'm a bit of a DBZ nerd :-/). I can't give a real opinion with out actually seeing it....but that would give money to the evil organization that makes the Red Ribbon Army look tame...20th Century Fox. Rumors have it that there is already a sequel in the mix. Via Anime Vice: Bulma Actress Emmy Rossum pleads for fans to watch movie. This is not an April Fools joke. Ayumi Hamazaki's new single, "Rule" is going to be the single for the movie. Its finally releasing in India on 17th of April. Stephen Chow was said to be dissatisfied with having no actual power as producer; Refuses to advertise "Dragonball"
According to "Apple Daily", Hollywood live action movie "Dragonball Evolution" has already entered countdown for release. The movie had been anticipated by Asian moviegoers because it was based on a Japanese manga, produced by Stephen Chow, and starred by Chow Yun-Fat. However during the promotion in Taiwan and Korea no sign of Stephen Chow the producer was seen, only Yun-Fat was there to manage the scene. Some sources state that Stephen had repeatedly suggested revising the script, but they were all ignored, making him feel looked down upon and so refused to attend any promotion activities in protest. The Fox sponsored, Stephen Chow produced, James Wong directed, Chow Yun-Fat and Justin Chatwin starred manga live action movie "Dragonball" will start screening next month, and Yun-Fat has already began his Asian promotion tour, but no sign of Stephen the producer was seen. Some US sources state that when the film began shooting, Stephen already had conflicts with the filmakers, so he was very unhappy with them. It was said that after Fox bought the rights to the Japanese manga "Dragonball", they had invited Stephen to be director, but he was busy with filming CJ7, so he only agreed to be producer, and Fox turned to James Wong to direct. At the start of filming, Stephen was really ethusiastic at the thought of cooperating with Yun-Fat, seen especially in his numerous suggestions to casting, scripting, make design and special effects during the planning. But these suggestions were all rejected by Fox executives, causing Stephen who enjoyed high prestige in the Hong Kong cinema industry to lose face. Since his first job as a Hollywood producer was only in name but has no actually power in decisions, Stephen decided no to attend any of the promotional activities for the movie in protest. A reported phoned Stephen to confirm, and he replied: "I am not able to attend the promotional activities because of the timing, and that promotion is not my job, so I already have other work scheduled". Regarding the rumours of him being producer without actual decision powers, Stephen said: "A movie has many types of producer, and I was the kind of advisory type of producer. Except for giving a few suggestions, I did not have an actual role". When asked if his suggestions were not accepted, he replied: "It's true they did not accept my decisions. Maybe they thought those weren't suitable, so they didn't use them. They have their own reasons for not accepting, but I won't mind, since it's the movie company who makes the decisions". When the matter of "Dragonball" author Toriyama Akira being dissatisfied that the movie isn't true to the original story, Stephen said: "Sorry, no comment". 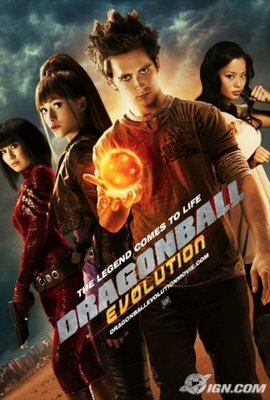 Ever since this movie adapted from the famous Japanese manga "Dragonball" began filming, it was criticized for lacking the original spirit, and even Toriyama Akira couldn't help to point out the movie did not look like his work at all. Kamesennin, the teacher of the main character Gokuu and played by Chow Yun-Fat, was bald, had a white beard, wears sunglasses, and looks strange in the original manga, but none of these traits were found on Yun-Fat. The original manga talks of Son Gokuu growing up in the mountains meeting the scientist girl Bulma, and then going off on the journey to seek the Dragonballs. But in the movie the Goku played by Justin Chatwin was a high school student who was told by his dying grandfather to gather the Dragonballs. The "Dragonball" manga and anime was loved by fans because of Toriyama Akira's colourful universe and interesting character designs, but the artistic design in the movie was dark and the camera leaned towards being grim, just like some regular Hollywood film. this movie will forever leave a huge brown stain on the underpants of the universe.Truly a sad day for otaku every where.